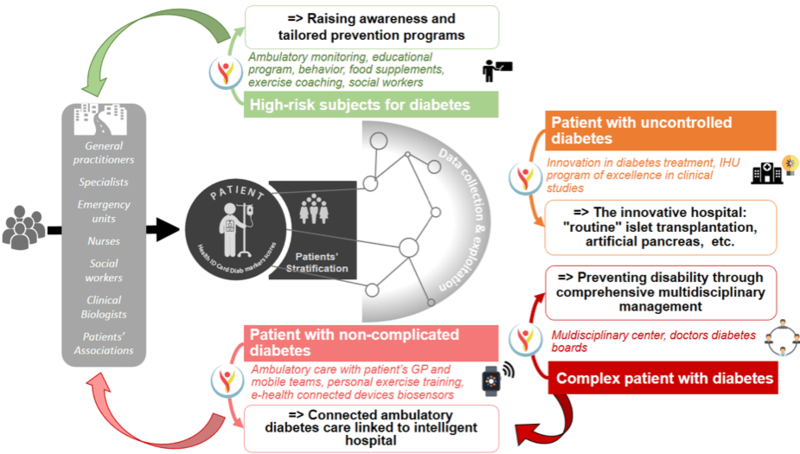 As a direct outcome of PreciDIAB future scientific achievements, we will dramatically transform the diabetes healthcare path in France by focusing it on the patient in his/her environment rather than on the disease. Individuals at highest risk for short term development of diabetes (type 1 and 2) (e.g. history of gestational diabetes, extreme obesity, strong family history of diabetes…). In addition, PreciDIAB mobile teams and partners will detect (pre)diabetes features, among lower income and homeless individuals in Lille area (Hauts de France being the French “region” with the highest proportion of poor people). Reduction in diabetes incidence in high-risk population groups, and of the severity of diabetes diagnosed in lower income population. Doubling the cost efficiency of diabetes prevention programs. All diabetic patients referred to the CHU of Lille and admitted in any department will benefit from PreciDIAB biomarkers-based evaluation of subclinical development of diabetic complications. To those whose risks of complications are assessed as low in the short-term, we will offer the benefit of PreciDIAB ambulatory diabetes care team (including their own GP, non-hospital consultants, nurses and social workers, who will benefit from specific e-learning programs on diabetes care …). Reduced ACSCs, improved diabetes control and quality of life for patients, reduced costs. Development of clinical research projects with primary care (GPs, healthcare centers…). PreciDIAB optimized daily clinical care involves a comprehensive multidisciplinary customized approach dedicated to these very vulnerable patients, with the aim to significantly reduce death and disability rates. Systematic multidisciplinary meetings will be arranged, with dedicated “doctor diabetes boards” (taking advantage of the Expert Medical Records database support, and a multidisciplinary center will be set up to care for the most complex diabetic patients with a special focus on elderly diabetic patients. Reduced Adverse Drug Reactions and life-threatening hypoglycaemia by 30%; heart/stroke related disability of 25%, decreased incidence of end-stage renal disease of 25%, delayed requirement for dialysis. Patients with severe diabetes resisting to conventional treatments need “exceptional” means to control the disease, permanently or for a short period of time corresponding to acute life-threatening conditions (e.g. infections, after surgery, during cancer chemotherapy). PreciDIAB will offer world class access to cutting-edge protocols and tools: artificial pancreas, and optimized pancreatic islet transplantation. In addition, PreciDIAB unique diabetes Clinical Trial Unit will enrol the most challenging patients in clinical trials of innovative drugs (developed by PreciDIAB teams or by drug companies).